The third Core Skill - Expand and Compress means the ability to enlarge and shrink or condense one’s entire posture, including all the joints and cavities and most especially the spinal column. In order to perform this, we will have already had to ‘Hardwire’ the joints, cavities and spinal vertebra to the spherical expansion and compression of the low Dan Tien. In addition to all that, we will also include all the muscles of the body, stretching them outward from the low Dan Tien or Centerpoint - Expand, and then ‘stretching’ them inward, from the extremities into the low Dan Tien - Compress. This inward and outward ‘stretching’ manifests in two forms, generally depending on the family style of Taiji we are practicing as well as the level of experience we have attained. At the beginning, this method will be fairly apparent as each posture will appear to slightly grow as we open and shrink as we close. But later the process becomes far more internal such that the postures don’t appear to have changed in size at all. But this is actually an illusion because the expansion and compression or condensation is still fully happening. Although very difficult to see, the results are easy for an opponent to feel during applications of the various types of Jing. This brings us to the 6 directions of Stretching and Compressing. They are, emanating from our center, Vertical (up and down) Horizontal (to the front and to the back) and Lateral (to the left side and to the right side.) When we can Stretch and Compress from, and to our Centerpoint, working all six directions simultaneously, we are essentially creating the beginnings of a Spherical expansion and condensation. However, true Spherical Expanding and Condensing not only includes the 6 directions, but also an almost infinite number of other angles which go into the making of a Sphere. In order for the novice to begin mastering this Core Skill, I advise using the technique known as ‘Snaking,’ that is, moving like a snake. This is where each of the segments of a snake’s body undulate, one after another in a linked, flowing sequence. This also means our whole body is acting in unison, either expanding or compressing. This is the first stage. Let’s take the posture An or Push as our example. Compression: Start from the tips of the fingers and stretching inward, condense the fingers into the knuckles of each hand. Next condense the back of the hands and the palms into the wrists. This will create a ‘Tile’ hand or hollow palm. (Like a Chinese roof tile.) From there, condense the wrist and stretch the muscles of the forearm back into the elbow. Now condense the elbow joint while stretching the muscles of the upper arms back into the shoulders. Next, close and compress the shoulders inward toward the shoulder blades using the Teres muscles. Finally, stretch the shoulder blades and the Rhomboid muscles further inward until you feel them linking to the spine. Please note, while working from the shoulder into the spine also feel the muscles of the chest condense and stretch upward and inward to the breast bone centerline. This is the basic procedure for connecting the fingers and hands to the spine and centerline of the chest. Expansion: First release the chest and upper back muscles downward, then relax them outward, stretching the Rhomboids to move the shoulder blades apart, then using the Teres muscles in back and the Pectoralis Minor muscles in front, open and expand the shoulder joints. Next, stretch and lengthen the upper arm muscles down to the elbow. Open the elbow joint and stretch and lengthen the forearm muscles down and out to the wrists. Lastly, open the wrist joints while stretching the muscles of the hand back out to the fingertips. This is the basic procedure for connecting the spine to the fingers. Next perform the same procedure for the lower body, going from the toes and feet to the ankles, up through the knees, hips, Kua and low Dantien and then back out again to the feet. Once these two procedures (upper and lower body) are mastered separately, they must then be performed simultaneously, remembering to extend the upper body condensation down through the lumbar and Ming Men regions in back and the upper and lower abdomen in front. 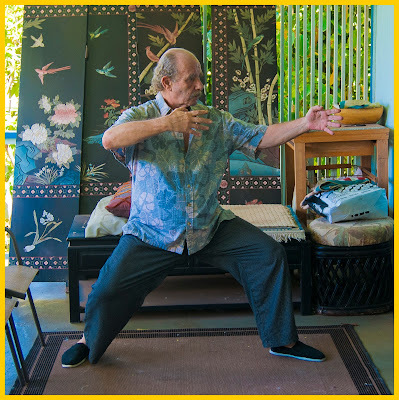 Although this will not be easy at first, it is certainly worth the effort, the results yielding more powerful Jing for martial arts and greatly enhanced circulation for better health. So to sum this up, eventually whole body condensation begins from the extremities (feet & hands, Baihui & Huiyin) and goes into the low Dan Tien, while whole body expansion goes from the Low Dan Tien out to the extremities. Later, when stage two is fully mastered, we can then move through our form using stage three. In stage three we create the actual state of Tai Ji within our body,’ that is, half the body is Yin - condensing, while the other half is Yang - expanding. Of course in our Taiji form the Yin and Yang parts of the body will be constantly exchanging as we move through all the postures and transitions. This is actually the modus operandi of Taiji fighting - where the Yin condensing half of the body intercepts and neutralizes the opponent’s attack while the Yang expanding half simultaneously issues Jing, striking the opponent’s vital points. Once again it is important to note that this idea of half Yin and half Yang is already embedded in each of the Taiji movements. In the final segment we will examine the fourth Core Skill - Twist and Release, which combines all the previous skills plus the spiral or silk-reeling power so often seen in the Chen family style of Taijiquan.